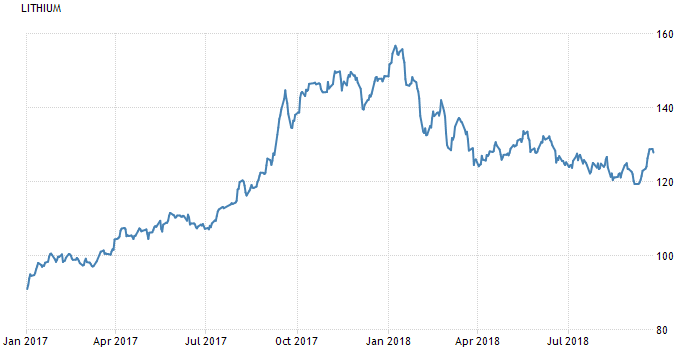 After an impressive rally spanning several years, the price of lithium came under pressure in 2018. Lithium prices reached an all-time high in January 2018 before falling almost 50% by summer, as a surplus in global metal supplies generally soured the market. Increasing market prices over the past several years have led lithium producers around the world to ramp up output. This caused the market to end up with a surplus of lithium supplies in 2018 — particularly in China, the world's largest consumer — and depressed prices. Oversupplies like these are not uncommon in the mining or oil markets. The price of oil, for example, fell drastically beginning in 2014 as new extraction technologies like fracking increased U.S. production to its highest levels ever. While we can most likely expect the surplus in global lithium supplies to continue putting downward pressure on prices in the short term, long-term demand is expected shore up the market. Lithium-ion batteries are used today in everything that needs cordless power. Laptops, notebooks, cell phones, power tools... there are probably a dozen lithium-ion batteries within 20 feet of where you're sitting right now. 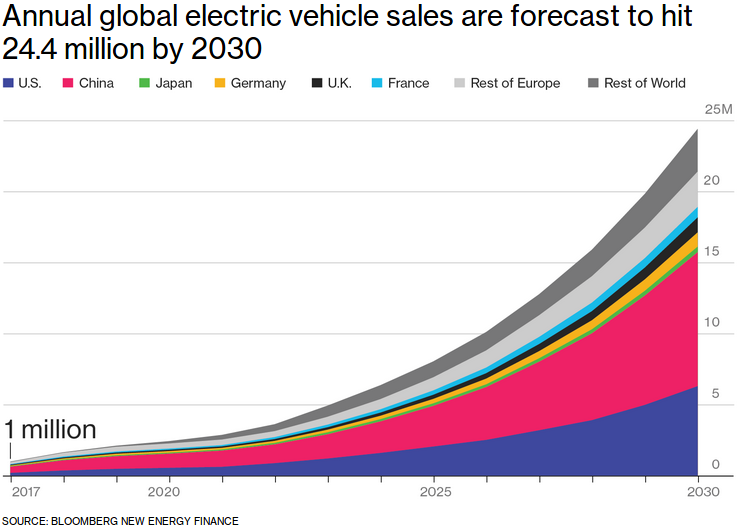 But we can expect the market to continue to be mainly driven by the proliferation of electric vehicles for the foreseeable future. Ten years ago, the electric vehicle revolution was coming. And even though the EV business has grown significantly over the past several years, the market is just now prepared to really take off. Global electric vehicle production is expected to increase by more than 30x in the next 15 years alone! And as a result, lithium demand is expected to follow. Much of the increase in demand for EVs is expected to come from new government regulations on vehicles aimed at creating less pollution. In China, for example, officials set a mandate for all automakers with annual sales of more than 30,000 vehicles in the country that will require 10% of all car sales to be all-electric or plug-in hybrid vehicles. By 2025, China wants a fifth of all cars sold in the nation to run on alternative fuel. The growth of the EV market in China and elsewhere has already created a significant increase in the demand for lithium. Since 2000, lithium demand has almost quadrupled. Global lithium demand projections for the future range from a conservative 10% CAGR over the next 10 years to doubling by the end of 2020. However, there are no expectations of weakening demand in 2019 or over the longer term. So while an oversupply pulls down on lithium right now, long-term demand is likely to wipe out surplus, and prices for the battery metal will continue their march higher. That makes 2019 a great year to be a lithium buyer. The electric vehicle market may also continue to be affected by negative sentiment surrounding Elon Musk, his antics, and skepticism of Tesla (NASDAQ: TSLA). From smoking a joint on camera to “pedo-gate,” Elon Musk drew a lot of negative attention to himself in 2018. And like it or not, Musk is the face of the electric vehicle market for now. Yet investors should not be swayed by any of this. Elon Musk is just one person. He's not the global market. Consider this: If Thomas Edison died earlier than he did, would the light bulb market have been significantly affected? No. Like Edison, Musk is just one man who is the face of the technology. And remember - Tesla’s competitors will make this one of the biggest battles of the century — one that entirely depends on lithium supply. Just like the Rockefellers, the Vanderbilts, and the Hunts at the start of the oil boom at the turn of the 1900s. Investors who get into position today will earn similar fortunes to those who invested in coal before the Industrial Revolution and nuclear in the 1980s. The way I see it, we're looking to capitalize on all aspects of the lithium revolution taking place (from production to product) just like the early backers of oil did back in 1901 — making millions for them and their families. I’ve done my due diligence in order to help you with entering the lithium-investment space in the best possible way, grabbing hold of the ground-floor profits as everything unfolds. This first little lithium player controls one of the largest lithium fields in the world. We’re talking enough lithium to fill up the entire Houston Astrodome! This isn’t some risky exploration project — the company is already producing lithium from this field and raking in revenues of $120 million. The second lithium player is practically sitting right in the backyard of Elon Musk’s $5 billion Gigafactory 1. It could provide Musk and company with enough lithium to meet his ambitious production target of 500,000 electric vehicles. And this property is in addition to a world-class lithium asset that it has a 50% stake in Argentina — one of the world’s lithium hot spots. The third play I have for you is a secret battery supplier that’s quietly secured a major contract with the U.S. government. In fact, it supplies the battery needs for all the branches of the military! The military is the nation’s largest consumer of energy, spending roughly $17 billion on fuel every year. And in an effort to get rid of that title, it's starting to make the move to electric vehicles. And the companies that I’ve uncovered could already be sitting at the finish line as the clear winners — ready to scoop up billions and billions of dollars of eager money. So, we're getting in now to enjoy the ride up. Everything you need to know about these three companies is included in an exclusive investment report that I've just written. It's called: "The Billionaire’s Battle: How to Invest in the Next Phase of the Lithium Revolution. You can’t find it anywhere else on the internet; you can only claim it right here, right now. Click here to learn more. The lithium battery was only just invented in 1980. It's still a baby. Right now, the focus is on electric vehicles. But there's no telling how lithium-ion battery technology will develop from here. We're likely to see mostly flat lithium prices throughout 2019. But this will be a great time to be a buyer for the long term.